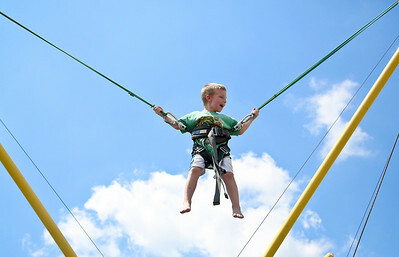 The McHenry County Fair opened Wednesday and will be open till Sunday. Josh Peckler - Jpeckler@shawmedia.com Casey Glass of Hughes Springs, Tex. pulls out corn dogs from a deep fryer as he prepares for customers during the McHenry County Fair Wednesday, August 1, 2012. Josh Peckler - Jpeckler@shawmedia.com Teri Palmer of Punta Gorda, Fl. weighs beef to be made into hamburgers on a scale as she prepares for customers during the McHenry County Fair Wednesday, August 1, 2012. 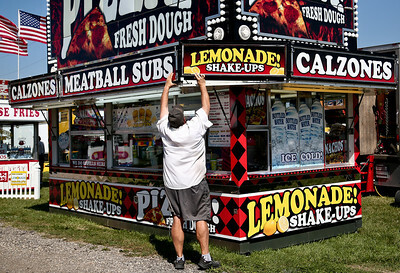 Josh Peckler - Jpeckler@shawmedia.com A vendor fixes a lemonade sign on his food stand as he prepares for customers during the McHenry County Fair Wednesday, August 1, 2012. 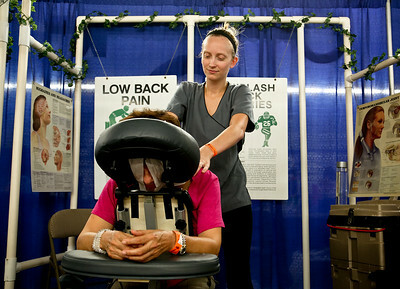 Josh Peckler - Jpeckler@shawmedia.com Megan Norton with the Strelcheck Chiropractic Clinic massages the back of Estella Patton of Woodstock inside one of the exhibitor booths during the McHenry County Fair Wednesday, August 1, 2012. Josh Peckler - Jpeckler@shawmedia.com Kelli Kampert, 12 of Huntley looks at a live beehive display during the McHenry County Fair Wednesday, August 1, 2012. 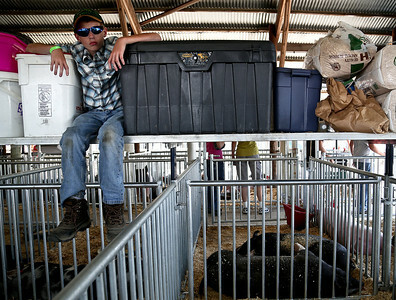 Josh Peckler - Jpeckler@shawmedia.com Brad Kearns, 12 of Union sits on a shelf as he takes a break from caring for his pigs inside the swine barn during the McHenry County Fair Wednesday, August 1, 2012. Josh Peckler - Jpeckler@shawmedia.com Gavin Hauck, 4 of Johnsburg lets out a smile as he flies through the air on a bungee jump trampoline during the McHenry County Fair Wednesday, August 1, 2012. Josh Peckler - Jpeckler@shawmedia.com Colleen Ziller of Huntley cares for her two cows inside the cow barn during the McHenry County Fair Wednesday, August 1, 2012. Josh Peckler - Jpeckler@shawmedia.com Jeff Beran of Walworth, Wisc. 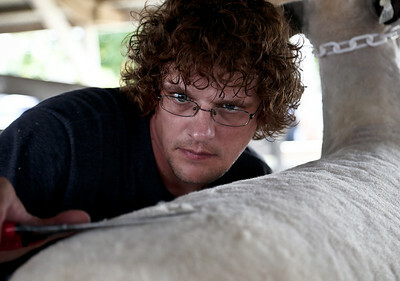 carefully trims one of his sheep inside the sheep barn during the McHenry County Fair Wednesday, August 1, 2012. 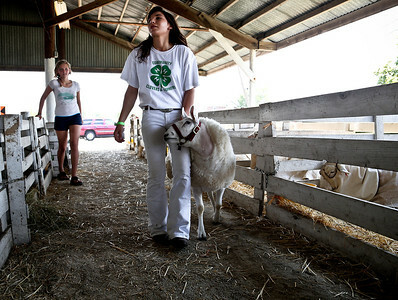 Josh Peckler - Jpeckler@shawmedia.com Abby Green of Garden Prairie walks one of her sheep while friend Brooke Prehn, 13 of Woodstock looks on inside the sheep barn during the McHenry County Fair Wednesday, August 1, 2012. 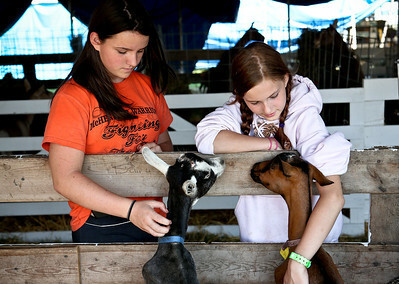 Josh Peckler - Jpeckler@shawmedia.com Erika Vahst, 14 of Mchenry (left) and Alyssa Pedersen, 11 of Crystal Lake pet goats inside the goat barn during the McHenry County Fair Wednesday, August 1, 2012. Colleen Ziller of Huntley cares for her two cows inside the cow barn during the McHenry County Fair Wednesday, August 1, 2012.